Wisdom teeth usually appear at the back of the mouth during the late teens or early twenties. Sometimes there isn’t enough room for them to come through the gum. A wisdom tooth that becomes trapped below the gum or only partially comes through is called an impacted wisdom tooth. Why don’t they fit in my mouth? There are a few theories. Some experts think genetics may play a part – for example, if you have inherited one parent’s small jaw and the other parent’s large teeth. Another theory is that our mouth size has reduced through the generations as our jaws don’t have to be as strong as our ancestors as our diets are soft and don’t wear the teeth away. Wisdom teeth only need removing if they cause problems. For example, wisdom teeth can be difficult to clean and are prone to decay, gum disease and infections. They may also put pressure on surrounding teeth, causing pain or damage. 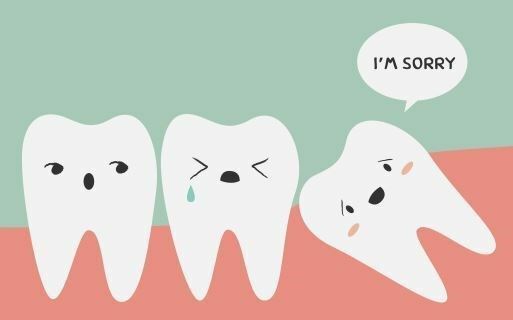 Studies show that the removal of wisdom teeth under the age of 25 results in better healing and less complications (bleeding/pain/swelling/infection) than older adults. Wisdom teeth can be taken out by your dentist using local anaesthetic if the removal is deemed straightforward. If the removal is more complicated, for example, if the wisdom teeth are still in the jaw (impacted) or very close to a nerve, your dentist may refer you to an oral surgeon who specialises in taking out teeth. Will taking out my wisdom teeth hurt? You may experience some swelling, minor bleeding and difficulty in fully opening your mouth after having wisdom teeth removed. It is best to discuss the risks and benefits of having your wisdom teeth removed with our dental team.